(1981) "Wake Up My Love"
"Teardrops" is a song by English rock musician George Harrison from his 1981 album Somewhere in England. It was also issued as the second single off the album, in July 1981. As with the lead single, "All Those Years Ago", Harrison completed the song after Warner Bros. Records had rejected his initial submission of Somewhere in England in September 1980. In response to Warner's concerns, he wrote "Teardrops" as an attempt at a commercially oriented song. Harrison recorded the song at his Friar Park studio in England with Ray Cooper as his co-producer. Despite some reviewers predicting it as a hit, the single failed to achieve commercial success. In the United States, it peaked at number 102 on Billboard's Bubbling Under the Hot 100 chart and number 88 on the Cash Box Top 100. Harrison later said that Warner's had complained that the album lacked an obvious single, and others had told him that a hit song had to be about "love gained or lost, directed at 14- to 20-year-olds". According to Derek Taylor, who presented Somewhere in England to the Warner's executives in late September, and then had to relay their disapproval, Harrison resolved to give the company the market-focused material they wanted. Whereas Harrison wrote "Blood from a Clone" as a riposte to Warner's intrusion, "Teardrops" was his attempt to satisfy the executives' demand for a hit single. [nb 2] The song is in the key of D and set to a medium-fast rock beat. Uncut contributor Jason Anderson described the song as a "mid-tempo shuffle." In his lyrics, Harrison sings from the perspective of a grief-stricken lover. Over the choruses, he states that, having cried "buckets full of teardrops", he appears to have "taken over from the rain". Author Alan Clayson writes that the song has the same lachrymose theme as "Tears of the World", one of the submissions that Warner's had objected to, but without the socio-political context. Harrison recorded "Teardrops" at his Friar Park studio in Oxfordshire during the second period of sessions for the album, beginning in November 1980 and extending to mid January 1981. Besides Harrison on guitars, the musicians were Herbie Flowers on bass, Ray Cooper on percussion, Dave Mattacks on drums and Mike Moran on keyboards. Cooper also helped produce the song. As on much of Somewhere in England, the track makes prominent use of synthesizer, a sound not commonly associated with Harrison's music. 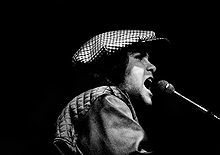 Beatle biographers Chip Madinger and Mark Easter liken "Teardrops"' feel and melody to the work of Elton John, as does author Ian Inglis, who highlights its resemblance to several of John's 1970s hits. [nb 3] Inglis partly attributes this to Cooper, who had worked extensively with John. According to music journalist John Metzger, as on the three other new tracks – "Blood from a Clone", "All Those Years Ago" and "That Which I Have Lost" – the production had "the peppy, pop-oriented sheen" that Warner's deemed necessary. Somewhere in England was issued on 1 June 1981, with "Teardrops" sequenced as the first track on side two of the LP. The song was then selected as the second single off the album, backed by "Save the World". The release took place on 20 July in the United States and 31 July in Britain. The song's publishing was assigned to Harrison's company Ganga, and subsequently to Umlaut Corporation. For the US single, the track was shortened to 3:20 in length, through the removal of a 41-second portion that begins at 2:31 on the unedited recording. In its issue dated 1 August, Record World magazine listed "Teardrops" first among its three "Hits of the Week" singles predictions. The reviewer wrote: "Mellifluous keyboards and a resounding title chorus that won't quit are an unbeatable combination on this follow-up to the top 5 'All Those Years Ago.' It's a natural for pop radio." Billboard also identified the song as a top 30 chart contender, describing it as a "lilting midtempo tune" in a similar vein to recent hit songs by Cliff Richard. The reviewer added: "It's punchy and energetic, a far cry from [Harrison's] ponderous introspective ballads of the mid '70s." In an otherwise highly unfavourable review of Somewhere in England, for Creem, Mitchell Cohen said that "Actually, 'Teardrops' is OK." In 2018, Uncut contributor Anderson complained that the song's "thin veneer of pep can't disguise its formulaic nature or its singer's indifference. The single failed to achieve commercial success. It missed the UK top 75, while in the US, it was listed at number 102 on the Billboard Bubbling Under the Hot 100 chart and peaked at number 88 on the Cash Box Top 100. On Billboard's Rock Albums and Top Tracks chart, measuring radio airplay, the song reached number 51. In November 1981, "Teardrops" was issued on a new single in the US, as the B-side to "All Those Years Ago". Harrison said that 1980 was the year when he stopped enjoying being a recording artist and "couldn't relate" to contemporary pop music. After completing his 1982 album Gone Troppo, he withdrew from music-making for over four years, partly as a result of the compromises he was forced to make with Somewhere in England, and partly because he had long found his role as a film producer with his company HandMade Films more rewarding. With "Wake Up My Love", the lead single from Gone Troppo, Harrison returned to the pop formula of "Teardrops". According to Clayson, this was a gesture designed to satisfy Warner Bros. in advance, while Harrison otherwise had no interest in the album's commercial performance and, as with Somewhere in England, made no attempt to promote the release. Chip Madinger and Mark Easter say that "Teardrops" was "probably the best of the toe-tappers that George composed for the revised Somewhere in England", and they describe its commercial failure as "inexplicable". Ian Inglis calls the song "a perfectly plausible piece of middle-of-the-road pop" that, through its origins as a purpose-written hit song to satisfy commercial considerations, "lacks Harrison's signature". Harrison biographer Simon Leng similarly describes the track as a "perfectly pleasant ... well-produced power pop tune with a catchy hook and an attractive bridge", but he dismisses it as "hack work" and "the kind of forgettable pop fluff that Harrison had been trying to escape for years". Alan Clayson says that "Teardrops" has "an ebullient backing and an ear-grabbing melody" and deserved to be a bigger hit than "All Those Years Ago". ^ Warner Bros. were also concerned that Harrison's album would suffer commercially when released beside John Lennon and Yoko Ono's Double Fantasy. Distributed by the company on behalf of Geffen Records, Double Fantasy was a highly anticipated release, as Lennon's first album in five years, and a work conceived for a contemporary pop audience. ^ Around this time, Harrison also wrote "Wrack My Brain" for Ringo Starr, who had a top 40 hit with the song, as a further attack on Warner's demands on its artists. ^ Inglis cites John's "Crocodile Rock", "Philadelphia Freedom", "Don't Go Breaking My Heart" and "Part-Time Love" as examples. ^ a b c d Madinger & Easter 2000, p. 459. ^ Clayson 2003, pp. 378, 381. ^ Ginell, Richard S. "Somewhere in England". AllMusic. Retrieved 3 January 2013. ^ Rodriguez 2010, pp. 387, 433. ^ a b c d Doggett 2011, p. 267. ^ Huntley 2006, p. 174. ^ Rodriguez 2010, p. 433. ^ Leng 2006, pp. 212–13. ^ Clayson 2003, pp. 377–78. ^ Madinger & Easter 2000, pp. 130–31, 459. ^ Rodriguez 2010, pp. 191–93. ^ Huntley 2006, pp. 179–80. ^ Kordosh, J. (December 1987). "Fab! Gear! The George Harrison Interview (Part 1)". Creem. Available at Rock's Backpages (subscription required). ^ Badman 2001, p. 263. ^ The Editors of Rolling Stone 2002, p. 179. ^ Inglis 2010, pp. 73, 76. ^ a b c Leng 2006, p. 223. ^ Rodriguez 2010, p. 33. ^ Inglis 2010, pp. 78–79. ^ "Teardrops". George Harrison Somewhere in England: Sheet Music for Piano, Vocal & Guitar. New York, NY: Warner Bros. Music. 1981. ^ a b Anderson 2018, p. 92. ^ a b c Clayson 2003, p. 378. ^ Harrison 2017, p. 424. ^ Badman 2001, pp. 263, 266. ^ Huntley 2006, p. 178. ^ a b c Inglis 2010, p. 76. ^ Badman 2001, p. 266. ^ Huntley 2006, pp. 182, 186. ^ a b c d Madinger & Easter 2000, p. 461. ^ Inglis 2010, pp. 76, 100. ^ Metzger, John (May 2004). "George Harrison The Dark Horse Years (Part Three: Somewhere in England)". The Music Box. Vol. 11 no. 5. Retrieved 26 August 2018. ^ Madinger & Easter 2000, p. 636. ^ a b Harry 2003, p. 367. ^ Madinger & Easter 2000, p. 633. ^ Badman 2001, p. 286. ^ Somewhere in England (LP credits). George Harrison. Dark Horse Records. 1981. ^ Harrison 2017, p. 548. ^ a b Harrison, Ed (reviews ed.) (1 August 1981). "Billboard's Top Single Picks". Billboard. p. 67. ^ "Hits of the Week". Record World. 1 August 1981. p. 1. ^ Cohen, Mitchell (September 1981). "George Harrison: Somewhere In England". Creem. Available at Rock's Backpages (subscription required). ^ "Somewhere in England Awards". AllMusic. Retrieved 3 January 2013. ^ a b "Cash Box Top 200 Singles". Cash Box. 15 August 1981. p. 4. ^ Trust, Gary (23 March 2010). "Album, Rock Charts Celebrate Anniversaries". billboard.com. Archived from the original on 26 August 2014. Retrieved 27 August 2018. ^ a b Whitburn, Joel (2008). Rock Tracks 1981–2008. Hal Leonard. p. 112. ISBN 978-0-89820-174-1. ^ Harry 2003, pp. 87, 156. ^ Badman 2001, p. 290. ^ Harry 2003, p. 128. ^ The Editors of Rolling Stone 2002, pp. 142–43. ^ Huntley 2006, p. 188. ^ Clayson 2003, p. 387. ^ Leng 2006, pp. 229–30. ^ Huntley 2006, pp. 185–86. ^ DeRiso, Nick (12 November 2017). "35 Years Ago: George Harrison Looks Inward on 'Gone Troppo', Then Disappears". Ultimate Classic Rock. Retrieved 27 August 2018. ^ Clayson 2003, pp. 391–92. ^ "Bubbling Under the Hot 100". Billboard. 15 August 1981. p. 30. Anderson, Jason (2018). The Ultimate Music Guide: George Harrison. Uncut. Harry, Bill (2003). The George Harrison Encyclopedia. London: Virgin Books. ISBN 978-0-7535-0822-0. This page was last edited on 17 March 2019, at 03:35 (UTC).